All FiveHits members now get access to our professional Tracker And Rotator system. 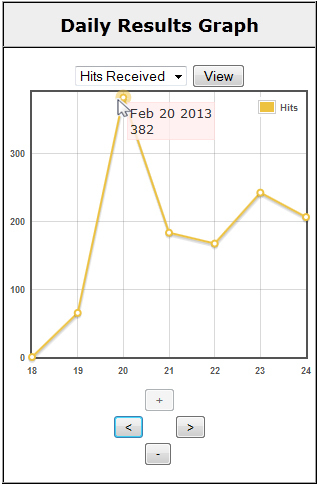 See how many hits your sites are receiving, and where those hits are coming from. The tracker keeps count of Unique Hits, Conversions, and other stats so you know where your site is getting the best results. Our trackers and rotators are easy to setup, and we'll even provide some tutorial videos to help you get started. Internet Marketers have a lengthy list of tasks on the road to fulfilling their dreams. Fortunately, you can take a pen and check off the challenge of getting traffic to your web site because you've just found the solution. FiveHits is a manual-surf traffic exchange, where our 15,000 members will eagerly come and take a look at your web site. All they ask in return is that you visit theirs. With our state-of-the-art surfing system, we've made it easier than ever to send a massive number of visitors to your web site. Our exclusive splash page builder will give you more for your click, and help you grab the attention of your visitors. Get more hits for each site you view! Dynamic Surfing Ratios - The more sites you view, the more hits you earn per click! Advanced Frame Breaker Detection keeps the exchange running smoothly so you can focus on sending hits to your site.